This spring semester, Northern Illinois University unveiled the newly renovated and expanded Fay-Cooper Cole Hall. The 1960s-era building, located at the heart of campus, has been transformed into a collaborative-learning environment that university officials believe will be looked to as a national model. The new Fay-Cooper Cole Hall features a state-of-the-art lecture hall, a new home for the NIU Anthropology Museum and a computer laboratory designed to cultivate collaborative problem solving skills. What had been one of the University's most outdated facilities is now among its most advanced. 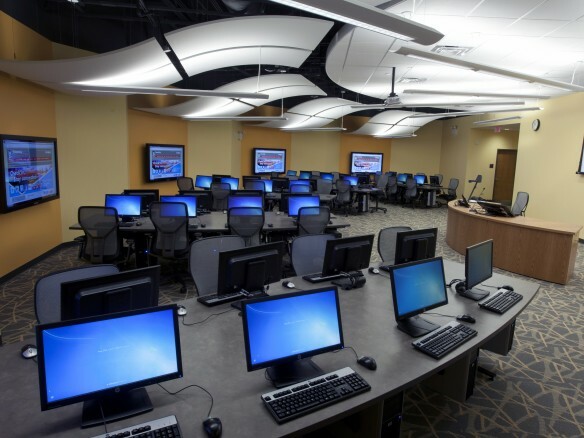 The Cole Hall Collaboratory Classroom: It boasts 48 computer stations divided among six separate learning pods. Each pod is equipped with a 65-inch, high-definition digital touch screen, enabling students to interact with educational material in the same way users interact with touch-screen iPads. NIU officials say it is not only one of the most unique and cutting-edge educational settings on campus, but anywhere. The Anthropology Museum: It offers premium museum exhibition space and a training ground for students. Features include movable walls for creation of customized exhibit spaces, low-iron glass displays for clearer viewing and an eye-catching 10½ -foot-long glass display case cut into the museum's exterior wall. The 351-seat Jameson Auditorium: The 43-year-old lecture hall has been completely overhauled with the addition of improved sightlines and access, technology supporting up to 750 wireless devices, comfortable seats that swivel 360 degrees to allow for small-group interactions, the highest-quality HD projection system on campus, back-of-the-room HDTV monitors and a full complement of smart technology to meet the needs of students and educators. Cole Hall was originally built in 1968 to house two 500-seat lecture halls. It has long played an important role on campus: Serving as the core classroom facility for many general education courses in the liberal arts, its lecture halls were used by about 6,000 students each semester. The facility was well known to tens of thousands of students and alumni. The multi-million-dollar renovations to Cole Hall were completed nearly four years after a deadly shooting inside the classroom building on the NIU campus. Cole Hall hasn't been used since the February 14, 2008 shooting that left five students and the gunman dead. NIU spokesman Paul Palian calls the re-opening another sign that NIU has come to terms with the tragedy. He says it "embodies the NIU spirit" and the university's commitment to always move forward. "Cole Hall has been at the heart of the NIU community since it first opened its doors, and it is personally inspirational for me to know that this building now will foster learning for tens of thousands of 21st century students," NIU President John Peters said. "We believe the newly renovated Cole Hall embodies the 'Forward, Together Forward' spirit that binds us all together." Long before work crews arrived to start the state-funded, nearly $6 million renovation, NIU began researching hundreds of case studies on how to create the best possible interactive-learning spaces. "We envisioned a setting where students learn, not only through lectures and textbooks, but also through online activity, visual representations and group interactions," NIU Provost Raymond Alden said. "We know from research that this blended-learning approach enhances retention and critical-thinking skills, and group interactions encourage students to put learned concepts into practice. So we found the top models nationally and, I think, improved upon them." Both visually and technologically impressive, the new Fay-Cooper Cole Hall provides students with an environment designed in every aspect to maximize educational experience. The facility's rebirth also carries a symbolic meaning for the NIU community. "It is fitting that Fay-Cooper Cole Hall now stands as testament to this university's resolve," Alden added, "a symbol of our vision for the future and a campus crown jewel." "The new Fay-Cooper Cole Hall has strong ties to the old Cole Hall, such as the beautiful exposed brickwork and high ceilings. However, the space is new and fresh and flexible enough to meet the future needs of the NIU community. It has felt more like a full new building project than a renovation," John Cordogan, principal of the architectural firm for the project, Cordogan Clark & Associates, said. "We have worked on numerous auditoriums and classrooms for higher education institutions. The spaces at Cole Hall are unique in regards to the cutting-edge technology," he added. The Cole Hall Collaboratory Classroom is a prime example. "No doubt, it will become the blueprint for future facilities on campus and beyond," said Frederick Schwantes, NIU vice provost for special projects. "The classroom design will maximize student-to-student, team-based collaboration during problem-solving challenges and will give opportunities for professor interactions with small groups at boardroom-like tables." In addition to the giant touch-screen panels at each collaboratory learning pod, an even larger screen is situated at the front of classroom, where the professor can project and interact with individual or group work. NIU faculty members say the classroom provides a whole new tool kit for instruction. "The technology of the Collaboratory is going to allow for a lot of educational creativity," said Geography Professor Lesley Rigg, associate dean for research and graduate affairs. Rigg taught previously in Cole Hall. "Professors now will be able to present their materials in new and more compelling ways, and students will not only interact with educational materials intellectually, but also physically," she added. "It's going to be an interactive experience unlike any other they've had in a school setting."